If you ask most people who Aunt Jemima is, most likely the reply will be a pancake mix and syrup. While this is true, it is also a generalization as the story of the original Aunt Jemima is pure Americana. The Aunt Jemima pancake story began in the 1880’s when newspaper man Chris Rutt and a friend named Charles Underwood bought the Pearl Milling Company and had the idea of developing and marketing a ready-mixed and self-rising pancake flour. 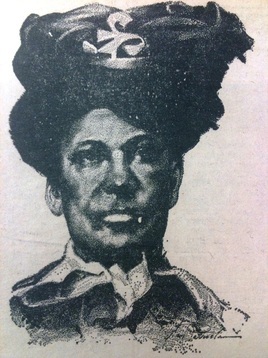 The name “Aunt Jemima” was inspired by a vaudeville show that Rutt attended where he heard a song of the same name sung by a minstrel performer in blackface wearing an apron and a bandana. The product was met with favorable results and in 1890 the two men decided to expand the marketing of their product by employing a woman to personify the fictional Aunt Jemima. Nancy Green was 56 years old when she was hired by Rutt and Underwood to bring Aunt Jemima to life. She was known for her excellent cooking and for her warm, approachable manner. She began promoting the pancake mix at shows around the Midwest. Her rapport with her audience was a rousing success. In 1893 the popularity of both the product and Green was so great that the rechristened Davis Milling Company began an aggressive campaign to increase sales. They took Green and Aunt Jemima to the World’s Columbian Exposition in Chicago where she prepared pancakes before thousands in character as Aunt Jemima. Her appeal was such a crowd pleaser that special policemen were utilized to keep the masses moving through her booth. More than fifty thousand units of Aunt Jemima pancake mix were sold. Nancy Green was such a success at the Expo that she was awarded a medal by its organizers and Davis Milling offered her a lifetime contract. This amazing success belonged to a woman who was one of the first groundbreaking African-American women in history. Nancy Green was born a slave on March 4, 1834 in Montgomery County, Kentucky. Not a lot is known about her early life. Following the Civil War and her emancipation in 1865, she moved north and worked as a cook and a housekeeper. She was married to a man named Hiram Green. The couple had two children who predeceased her and she was widowed by the time of her employment in 1890 by Davis Milling. With her sudden popularity in middle age, Green became one of the first African-American spokespersons and her portrayal of Aunt Jemima made her a living trademark. She became famous on a national scale and used her notoriety to expand her career. She was soon travelling as a storyteller along with her work as Aunt Jemima. Her shows were almost always sold out events and her warm persona gave her an enduring following with audiences everywhere she went. Nancy used her fame as well as the money she made from her work to bring attention to the plight of African-Americans struggling in poverty to survive in the years following the Civil War. She became one of the first black philanthropists and her efforts to improve the quality of life of her contemporaries would help lay the foundation for generations which followed her in what would become the Civil Rights Movement. Nancy Green died at age 89 on September 23, 1923 from injuries sustained in an automobile accident in Chicago. She was still performing as Aunt Jemima right up until the end. 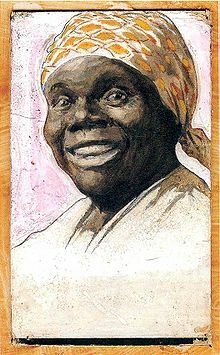 In the decades following her death, the Aunt Jemima character would be recast and portrayed by a variety of actresses. The logo would change as well but the warmth of the character would not be lost. Even in the sixties, when the Aunt Jemima characterization became reviled by civil rights activists in much the same manner as Uncle Tom, the smiling face and inviting demeanor of the trademark would not be tarnished. The legacy Nancy Green left for those who’ve followed her is one of courage, talent, and the indomitable strength of the human spirit. The success this woman achieved remains enviable. That this impressive distinction belongs to a woman who was born into slavery, worked her way through life in the bleak years for African-Americans that succeeded the Civil War, and culminated in one of the first celebrity statuses attained by a black woman is inspiring. Her name is inscribed in the annals of American history with dignity and with pride in what one person can accomplish no matter what odds they face. Nancy Green is a legend. And rightfully so. Excellent post. Its information I may never need to know but am so glad to have learned. Thanks! Glad you enjoyed it. Cheers! What an amazing woman!!! Thank you, so much, for this story.